Ce brunch m'a l'air à tomber!! sur Frost, defrost, no-frost... brunch? 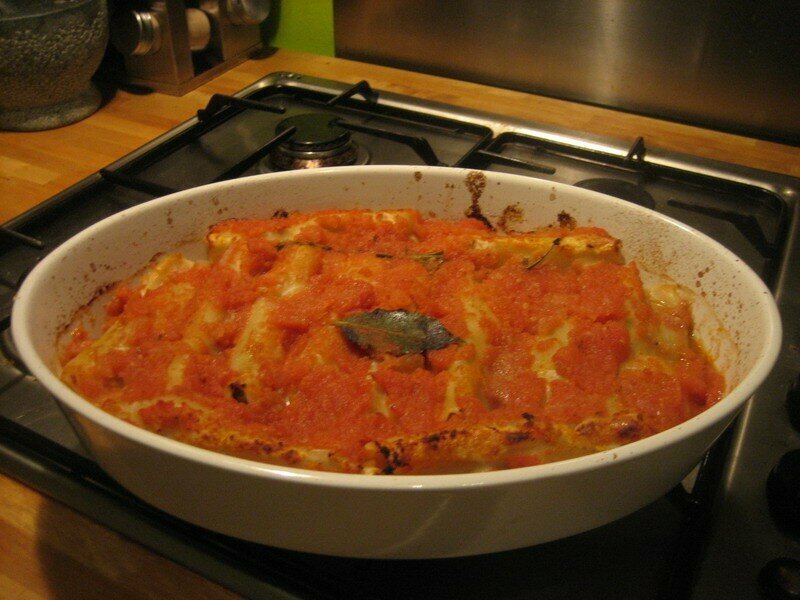 MIAM ! ce que ça a l'air bon ! Je crois que je sur Frost, defrost, no-frost... brunch? Thank you Eid moubarak et Mabrouk à tous sur Aid Moubarak! I might not have told you yet: I am blessed with a morrocan mother and a wonderful cook. She can cook about anything and always makes it magical. I still remember when my bro' and I would go to a fancy restaurant with my parents when I was little. 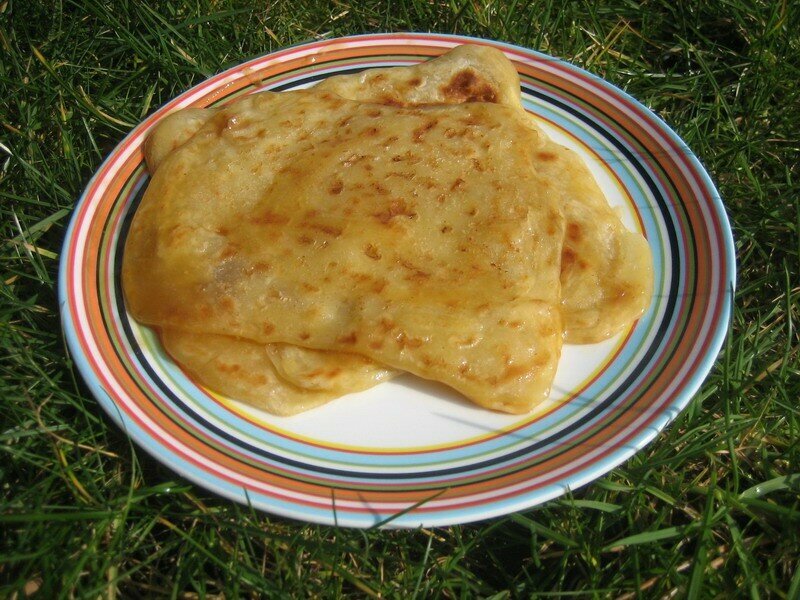 We would of course always try the dishes from one another and comment passionately on our favourite... A couple of weeks later it would usually come out of our own kitchen right into our plates, more delicious than ever. Our favourite game back then was to make her guess the secret ingredient of the chef and observe his surprised look. She hardly ever failed! I wish one day I can do that too. When it comes to her specialty dishes and in particular morrocan ones, I always have an hesitation before I decide to cook it. Could I stand the comparison? Couscous, tajines and pastillas hardly ever come out of my kitchen, partly because of that. 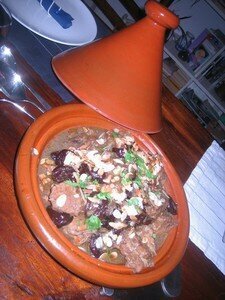 Last weekend, I realised that it was at least a year since I took out my tajine from the top shelf. I missed it (plus I remembered the little of envelope full of saffron that one of my girlfriend's mom brought me back from morroco). So, I gave it a try thinking of my mom and her magical fingers. The empty tajine and my guest satisfied looks after the prunes and veal tajine I cooked that evening left me with the dreamy thought that maybe one day, I could be a magical cook too. Caught in the action, I forgot to adjust the manual settings of the camera! 1 large bowl of warm tea. In a bowl, pour the warm tea over the prunes, and set aside. Clean the meat an cut it in large pieces (~6x6 cm). Peel and chop the oignons and shallots. 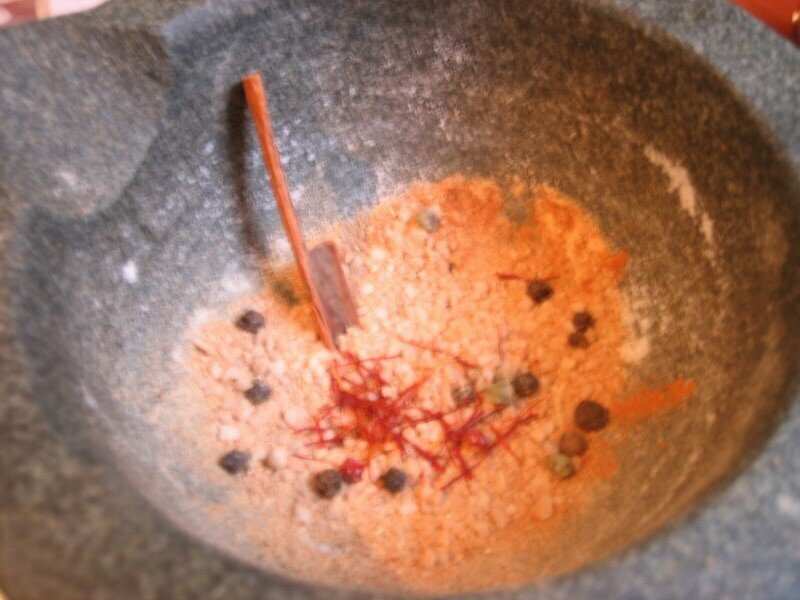 In a pestle, pour all the spices, salt and pepper and grind them thinly. Put 2/3rds of the butter to melt in the cocotte on high fire. Season the meat with 2/3rds of the spices and brown it on all sides (it's better to proceed in two times). 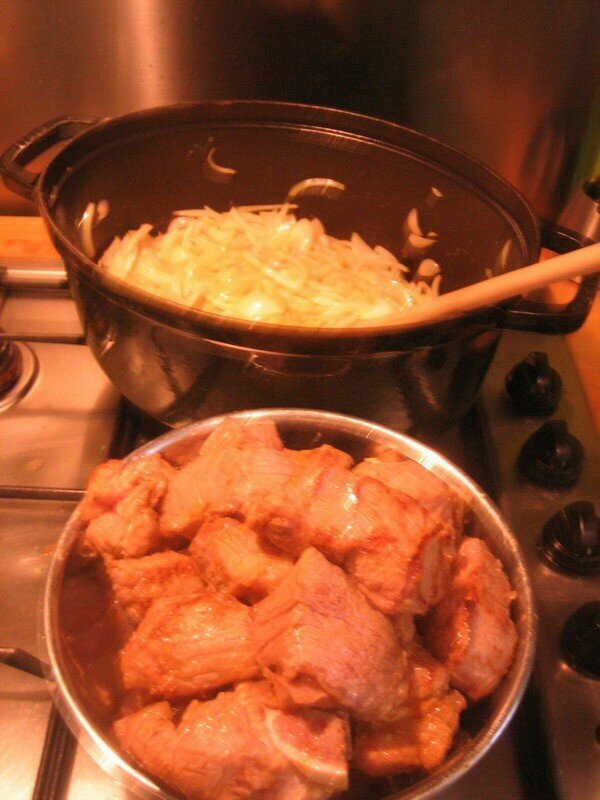 Reserve and pour the remaining butter, the oignons and shallots and the remaining spices. When the oignons get transparent pour back the meat and cover with the tea in which you marinated the prunes and if necessary a little bit of water, just enough to cover the meat. Lower the fire, cover the cocotte and leave to simmer for 1 hour. Have a look from time to time to check the fire isn't to high. After one hour, add the prunes and a tablespoon of honey and leave to simmer for 15 more minutes. You're done. You can serve write away or warm up later. In morroco, we usually eat tajines all together from the same dish, with our hands and a lot of fresh morrocan bread, and salads on the side. However I usually choose for a more european version as my dutchie cannot part from his cudlery. 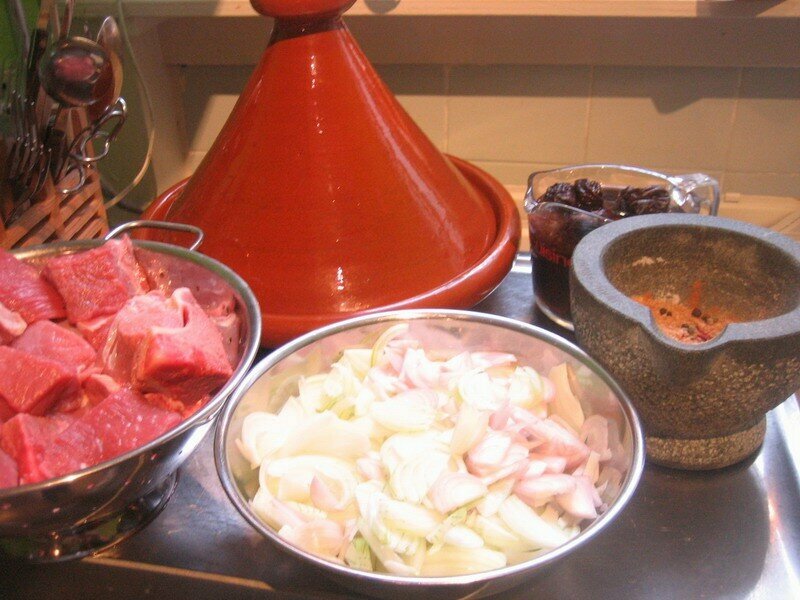 If you recognise yourself or your guests in him, serve the tajine with fragrant basmati or thai rice. It's a perfect match. chroniques sporadiques d'une incorrigible gourmande.